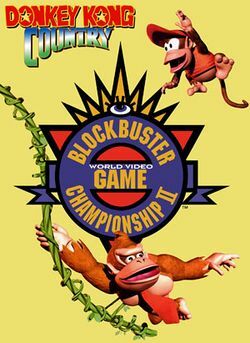 The Donkey Kong Country Competition Cartridge is a cut-down competition variant of Donkey Kong Country manufactured for use in the Nintendo PowerFest '94 game competition and later featured in the Blockbuster World Video Game Championships II event. Following the end of the later contest, copies of the Competition cartridge were sold in a Nintendo Power subscribers catalogue. Due to its rarity (the back insert states the print run was of 2,500 copies), the game has become a prized collector item. The actual game consists of a few select levels from Donkey Kong Country with the addition of a point counter and a few minor tweaks to encourage scoring, the goal being to score as many points as possible. The tree house and banana cave at the start of Jungle Hijinxs have been disabled and all of the Animal Tokens in the early levels have been replaced with banana bunches, making it impossible to reach the bonus round without the usage of a cheating device. The player is also given 50 starting extra lives instead of the 5 as in the original game. The game has a time limit of five minutes, which is displayed at the center of the screen. After the allotted time, the game freezes. The competition cartridge is very similar in concept and execution to the Star Fox Super Weekend cartridge, another video game competition variant which has become a valuable collector item. This page was last edited on August 24, 2018, at 20:30.